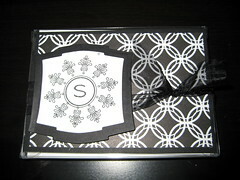 I found the best little surprise in my mail the other day…these adorable note cards made by Sandy! I love them! Sandy, you totally need to sell the awesome cards you make! I’m such a sucker for note cards and stationary, especially cute ones like these! Thank you so much Sandy!